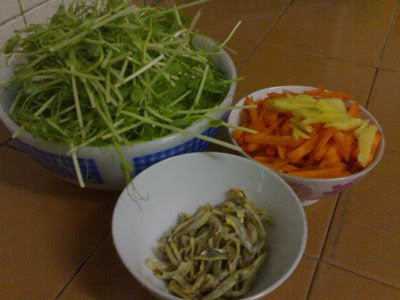 I have pea sprouts, carrot (sliced), ginger (sliced), anchovies (soaked & washed). 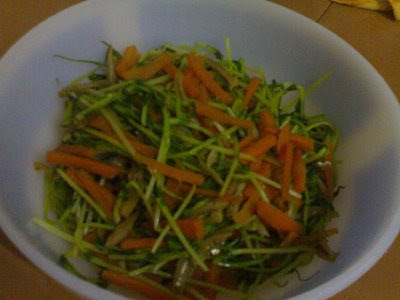 Stir fry ginger, then anchovies, then carrot, and finally the pea sprouts. Add a little bit of water. Add light soy sauce to taste. Anchovies and ikan bilis are different wor ... what do you call ikan bilis in English anyways? Extracted from the URL above: In South East Asian countries, anchovies are known as "ikan bilis", "setipinna taty", or in Indonesia "ikan teri", with "ikan" being the Indonesian word for fish, or "dilis" in the Philippines. In Indonesia, Malaysia, and to a certain extent Singapore, anchovies are used to make fish stock, sambal, or deep fried. Ikan Bilis is normally used in a similar way to dried shrimp in Malaysian cuisine. Anchovy is also used to produce budu, by a fermentation process.